Don't like Brussel Sprouts? 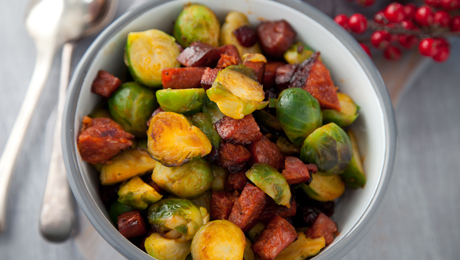 These Caramelised Chorizo, Cranberries and Bread Brussel Sprouts will change your mind. Place the chorizo, bread, half of the butter and the thyme into the bowl of a food processor and pulse once or twice. Season with salt and pepper. Pour the combined contents into a bowl. Meanwhile, bring a large pan of salted water to a boil. Add the Brussels sprouts and simmer for 5 minutes. Using a slotted spoon, transfer the sprouts to a bowl of ice water. This is important to stop the cooking process. Heat the olive oil in a very large, heavy, non-stick frying pan over a low heat. Add the chorizo and bread mixture and cook, shaking the pan frequently to colour and caramelise the bread and chorizo. Season with salt and pepper. Remove the mixture from the pan to a small bowl and add the dried cranberries. Return the pan to a high heat and add the sprouts. Fry for 3 to 5 minutes, until slightly coloured. Season with salt and pepper and add the remaining butter. Stir in the chorizo mixture and toss to combine briefl y. Transfer to a platter and serve immediately.